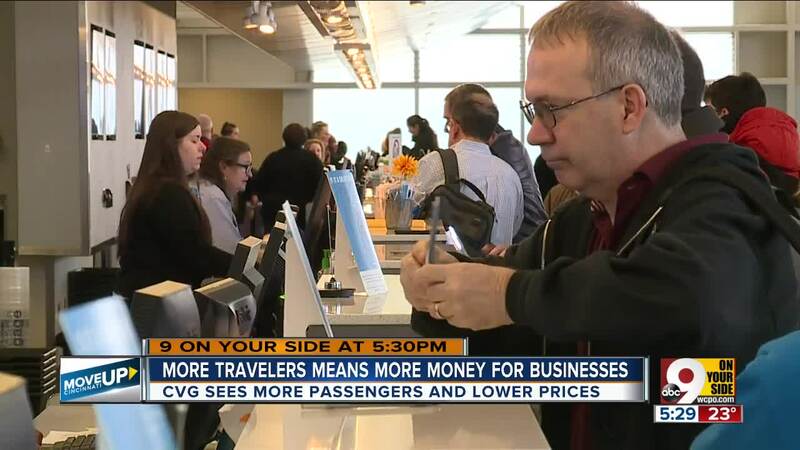 CVG is seeing more passengers and lower prices. HEBRON, Ky. — Patrick Woods has a flight to catch at CVG. Woods doesn't live close by. He lives about 70 miles away in Indiana. But the low cost of flying out of CVG has brought him here rather to another of the Tri-State’s regional airports. "Looked through the airports between Indianapolis, Cincinnati and Louisville because they're all the same distance away from home,” Woods said. “Cincinnati is the cheapest and very easy to get in and out of." Woods is one of the growing number of people choosing to fly through Cincinnati/Northern Kentucky International Airport. CVG says it's one of the fastest growing airports in the country. Numbers show 2018 was a soaring year with 8.9 million passengers, and the projections keep pointing skyward. CVG has a new passenger goal of 9.4 million in 2021. The low fares are a big attraction, but the mix of carriers is also a big plus, said Mindy Kershner, airport spokesperson. "It's very strategic. It's a diverse mix of air carriers,” Kershner said. “So now we have this wonderful mix of legacy carriers - American, Delta, United. And, we have low-cost carriers or ultra low-cost carriers - Allegiant, Frontier, and we have Southwest now." All of this travel is translating into billions of dollars for the region. The projected annual economic impact by 2021 is $5 billion, and many believe it could surpass that. It "Move Up Cincinnati." And we have a team of reporters covering this topic on-air and online at WCPO.com.